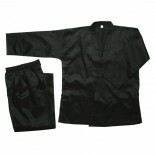 Quality Martial Arts uniform. Jacquard pattern fabric. 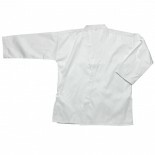 Embossed jacquard fabric reduces instances of the uniform sticking to skin due to perspiration. Size: 00, 0, 1, 2, 3, 4, 5, 6, 7 .. This popular student uniform is made of 7oz. poly cotton fabric with elastic pants. Stitched 6 times in the cuffs and hems to maintain strength and durability. • Size: 0000-9 • Color: White, Black, Red, Blue • Material: Poly Cotton • Elastic waist • Interior draw string • Set includes jacket, pants and white belt • Machine washable .. 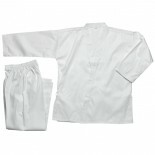 This student uniform is made of traditional 100% Cotton fabric with drawstring pants. Stitched 6 times in the cuffs and hems to maintain strength and durability. • Size: 000-7 Silk screen is available up to six colors. • Material: 100% Cotton. • Set includes jacket, pants and white belt. • Machine washable. Call for details. .. This popular student uniform is made of 7oz. poly cotton fabric with elastic pants. Stitched 6 times in the cuffs and hems to maintain strength and durability. • Size: 0000-9 • Color: White, Black, Red, Blue • Material: Poly Cotton • Machine washable .. This popular student uniform is made of 7oz. poly cotton fabric with elastic pants. Stitched 6 times in the cuffs and hems to maintain strength and durability. • Size: 0000-9 • Color: White, Black, Red, Blue • Material: Poly Cotton • Elastic Waist • Machine washable .. This popular student uniform is made of 7oz. poly cotton fabric with elastic pants. Stitched 6 times in the cuffs and hems to maintain strength and durability. • Size: 0000-8 • Color: White, Black, Red, Blue • Material: Poly Cotton • Elastic waist • Set includes jacket, pants and white belt • Machine washable .. This popular student uniform is made of 7oz. poly cotton fabric, jacket only. Stitched 6 times in the cuffs and hems to maintain strength and durability. • Size: 0000-8 • Color: White, Black, Red, Blue • Material: Poly Cotton • Machine washable .. This popular student uniform is made of 7oz. 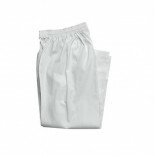 poly cotton fabric, elastic pants only. Stitched 6 times in the cuffs and hems to maintain strength and durability. 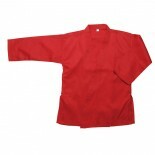 • Size: 0000-8 • Color: White, Black, Red, Blue • Material: Poly Cotton • Machine washable ..
Top of the line martial arts uniform. Two sided brushed fabric provides a smooth feel and excellent flexibility. Double stitched throughout, 100% cotton. Traditional drawstring waist. Expert craftsmanship and durable materials ensure a long lasting, quality product. 14 ounce heavyweight uniform is comfortable and does not inhibit your range of motion. 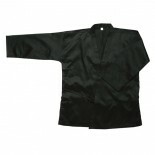 • Size: 2-7 • Material: 100% cotton ..
Top of the line martial arts uniform. Two sided brushed fabric provides a smooth feel and excellent flexibility. Double stitched throughout, 100% cotton. Traditional drawstring waist. Expert craftsmanship and durable materials ensure a long lasting, quality product. 14 ounce heavyweight uniform is comfortable and does not inhibit your range of motion. • Size: 2-8 (New Size 8) • Material: 100% cotton w/ drawstring p.. 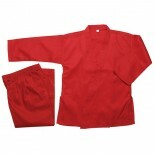 This popular student uniform is made of 7 ounce poly cotton fabric with elastic pants. Stitched 6 times in the cuffs and hems to maintain strength and durability. • Size: 000-7 • Colors: White, Black, Red, Blue • Material: Poly Cotton • Elastic waist • Set includes jacket, pants and white belt • Machine washable .. This popular student uniform is made of 7oz. poly cotton fabric, jacket only. Stitched 6 times in the cuffs and hems to maintain strength and durability. • Size: 000-7 • Colors: White, Black, Red, Blue • Material: Poly Cotton • Machine washable ..